The Letterpress Printing Museum is set up as a typical regional printing office of the Letterpress era and has working printing presses, equipment and type. 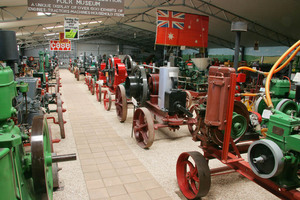 The Gum Family Collection consists of restored stationary engines, tractors, farm and household memorabilia, backed by a panoramic Mallee mural. 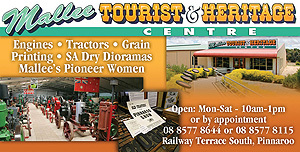 A dryland farming display, with the theme ‘CONSERVE THE WATER – CONSERVE THE SOIL’, has six landscape dioramas and interpretive panels portraying agricultural development and production in the district over the hundred years. The Mallee Women display focuses on the theme ‘they stood beside them’. It is an evocative display demonstrating the contribution made by women as they supported the men in the settlement of the Mallee. 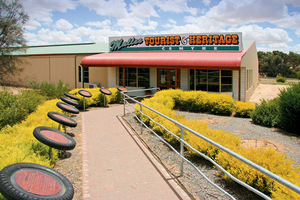 The “Spirit of the Mallee” has been interpreted with a series of clay plaques on concrete ‘motor tyres’. The plaques bear information explaining the various aspects common to Mallee communities – Water, Fire, Mallee, Land Use, Settlement, History, etc. Pinnaroo is a young town, but its past 100 years are packed with history. What then can we celebrate as we recall the high spots in the birth of the town and district? The trail-blazers, the pastoralists - Butcher, Morphett, White, the Hensleys, and others. The opening of the land for settlement by a government with a few far-sighted statesmen showing the way. The adventurous, persevering pioneers and their women folk who braved the climate and suffered the privations, to clear the mallee, sow the crops and periodically watch them die. The business people, no less pioneers, who came to serve the stalwarts of the bush, the workers who risked their all, with no security. The coming of the railway in 1906, to help open up the country, to bring and take away goods, later to be systematically run down in the blind rush of progress. The formation of church groups, schools, literary and music societies, public halls. district councils, to provide the purest form of government - local government. The history of these and more was dealt with in 1961, when as a newcomer I endeavoured to record history before it was forgotten, in the book "Land of Promise," at the same time commemorating the first 50 years of the local newspaper, Pinnaroo Border Times, begun by John Letheby in March 1911. Interest in local history quickened in the 70's and in 1983 we celebrated 75 years of local government. 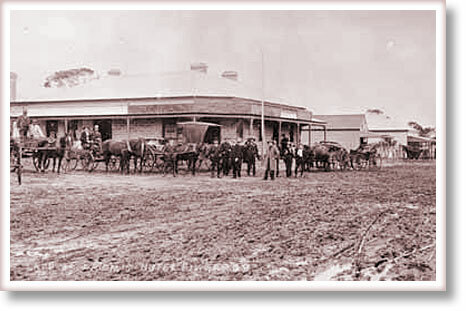 The fact that the District Council of Pinnaroo, formed in 1908, had its head office in Lameroo made no difference. 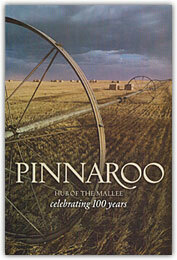 To tie in with the celebrations, the Pinnaroo Historical Society produced a comprehensive and easily readable book, "Pinnaroo, Miracle of the Mallee." To build a railway into an agricultural area before it has been settled and proved, was a radically new idea, but that is what was proposed in 1892, and although settlement had commenced more than a year ahead of completion of the railway in 1906, the concept proved an outstanding success, as it gave the settlers an immediate outlet for their produce and regular delivery of their supplies. 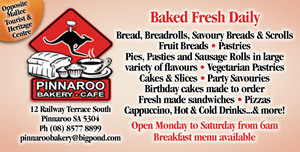 The following information compiled by Beth Marshall, was printed in "Pinnaroo, Miracle of the Mallee" in 1983. 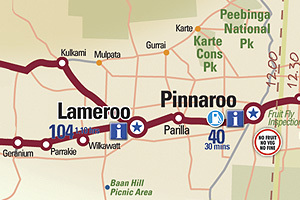 Far-sighted politicians and public servants realised that, if the Pinnaroo country was to be successfully settled by wheat farmers, it was essential that a railway line be provided as a connection with the nearest existing railway. The Pinnaroo line, the cheapest of 5ft 3in gauge so far laid in Australasia, was built as a light railway to pioneer and open up the country, and to carry a small amount of inward freight and outward produce. It was designed for travel at no speed faster than 20 miles per hour, but derailments were frequent, even at slower speeds. The Railway was offi cially opened by the S.A. Premier, Mr T. Price, on Friday 14th September 1906. 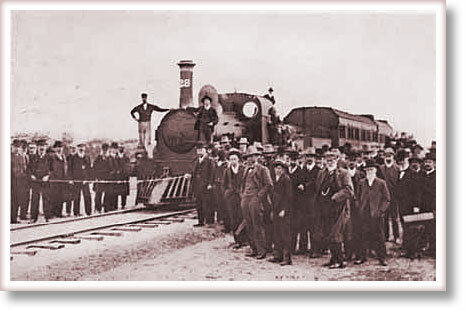 Two trains were needed to take all the official guests to the opening ceremony at Pinnaroo, and the settlers from miles around gathered in the railway yard to witness the ceremony. Water is an integral part of survival. The discovery of sub-artesian water below most of the Mallee lands was instrumental in the development of the area. Irrigation from this underground water resource has provided economic development complementing the existing dryland agricultural industries. Little information can be sourced on the use of the land near Pinnaroo by the Aboriginals. The Aboriginal tribe inhabiting the area before white man was called the "Ngarkat" tribe. We would assume they led a very nomadic life, travelling from soak to soak across the area depending on the availability of water. They left considerable evidence of stone flakes where they camped near soaks. RG Kimber's "The Ngarkat" 1968 provides a fascinating thesis concerning their existence. (Pinnaroo - Miracle of the Mallee - 1983) Pastoral Uses of Water from 1869 to 1906 The early pioneers of the Pinnaroo District are well documented in "Pinnaroo - Miracle of the Mallee". Developing the pastoral leases was contingent on availability of water and early attempts were inhibited due to the lack of surface water and the depths of sixty to eighty metres required to access the underground water. Old whim well at Pinnaroo, with storage tanks and troughs. In 1893-94 a water supply for the Pinnaroo area was noted in a Public Works Report. This remained as a public watering hole until about 1951. The equipment was sold and removed and the well was fi lled in 1960. In 1927 a bore was drilled in Pinnaroo to 600ft in the Engineering and Water Supply depot for Town Water Supply. A water reticulation scheme was set up with an elevated concrete tank. The pump was originally powered by an oil engine. This was replaced when electricity was supplied to the area. In 1942 a large suction gas engine was installed for backup. Extra bores were drilled to meet new demands for the town as it grew. No 2 Bore in 1952 - West of the Police Station, No 3 Bore in 1958 - Eastern side of the Adelaide Road, and No 4 Bore in 1971 - South-east corner of the Showgrounds. The town water supply is now pressurised. The concrete water tower was demolished in the 1990's. The Mines and Energy Department could envisage the potential use of the underground water resource for extensive irrigation into the future. Plans began in the early 1980's to proclaim an area near Pinnaroo and Lameroo as an irrigation area. The quality and quantity of water was excellent for horticultural use, however careful management needed to be put in place to ensure the water resource was used sustainably. Hydrologists calculated how much water could be extracted from the resource allowing an overall mining of the aquifer by an average of 5cm per year. This would mean that 16% of the resource would be used after 300 years of irrigation, if there was 100% usage of the irrigation allowed. They set about developing a plan to allow water for irrigation on a Hundred basis to ensure irrigation did not occur in one area only and to promote development throughout the district. The perennial question asked by visitors to the Mallee is "How come your lawns are always green with your limited rainfall?" The short answer, of course, lies with the underground water supply. The longer answer is in the way this resource has been utilised. Yes, our lawns are green and our gardens are healthy. But it was not always so. During the past hundred years, and particularly the last fifty, individuals and groups have lent their efforts towards the greening of our towns and district. In Pinnaroo's case, several names come to mind. Back in the 1950's, a member of the floating population, bank manager Gordon Hosking planted and looked after a small patch of lawn in the Soldiers' Memorial Park adjacent to the Scout Hall and Swimming Pool. The wide expanse of grass hundreds of metres wide and long that we enjoy today gives no hint as to how it started. Gordon was a quiet public-minded man, interested in public facilities, who has left his mark, but no name, except in the memory of a very few people. Norm Napper, local farmer and bush poet, had a vision for a green Pinnaroo. A lover of nature, with a love for others' welfare inspired by suffering and living with an amputated leg, Norm encouraged in his writings the development of a greener town. The time we cleared the Mallee land this side of Pinnaroo. While we rolled the mulga back for miles, this side of Pinnaroo. It was hard upon the horses and hard upon the gear. Our words to urge the team along could not be mentioned here. The scrub went up in smoke and flames-heat laden winds they blew. The days we cleared the Mallee scrub this side of Pinnaroo. The tea was in the billy can; the toast was in the pot. As we sat around the fire at night, our troubles we forgot. But we cleared the mulga from our block this side of Pinnaroo. Promise Hotel (now Golden Grain) about 1910. The greatest growth in the town and district of Pinnaroo probably occurred in the first 20 years - a township was surveyed, humble houses erected, and just-as-humble business premises, mostly of galvanised iron. Trade competition was keen and employment opportunities plentiful. Soon the town was throbbing with life, with a population of 3000 people. Churches were built, schools, hotels and hospitals appeared, and as each new family was added, one extra person was needed on the service team. The school grew from a score of pupils to more than 200, so more teachers were needed, not only in the town but in the small schools which were started in the surrounding area. 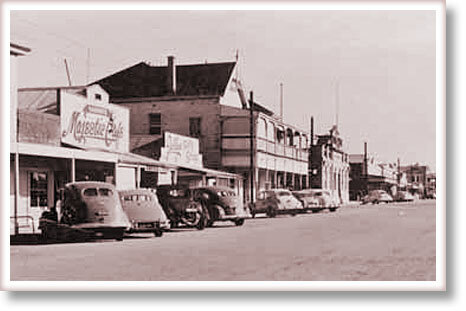 Builders came, suppliers of building materials, carriers, coachbuilders and blacksmiths, saddlers and shoe shops, stores and cafes, until the single-sided main street overfl owed into the side streets, and everything pointed to a busy and prosperous Pinnaroo. The Railway came and with it the porters and clerks, guards and gangers and their families. What amazing forward planning by a young state, to lay a railway line to service a string of settlements being birthed in the Pinnaroo Country. A District Council, a school, an agricultural society, a local newspaper, an institute hall and a railway station were among the community developments in that fi rst decade. The main street boasted no fewer than four double-storey buildings, two of them hotels, while the new Institute and Railway Station appeared in the 20's. This article seeks to present the changing picture, however imperfect it may appear at this time distance, of how progress in one area could assist some services to grow, while leading to a reduction of services in another. The first adverse stroke was the drought of 1914, followed by four years of war. The drought spelt the end for some of the settlers, who left the district, while the war drained the district of its young man-power. Those who carried on had to "put in the extra pound," and some earned the reward. Good years following the war just could not last, as the high interest rates brought on the inevitable depression, which sent many to the wall, the winners being those who had enough money to tide them over and the banks who handled it. For those who had come up the hard way, the experiences of the Great Depression were part of life's struggle, but for many who had only known good times it was disastrous. For those on the land, low grain prices did not provide sufficient to live on, and for those in the town who lost their jobs, it was often worse, unless they had fowls, a cow, or could grow vegetables and fruit. The ill effects were passed on to the tradespeople, for while the Government of the day could legislate for debt adjustment for those struggling on the land, the local store often had to bear the brunt. Some store-keepers continued to supply families' needs; some went broke, and some went insane. Life continued its vicious cycle of good years/bad years. In common with the rest of the country, the district had not long to enjoy the good conditions following the Depression, and they became embroiled in the 2nd World War (1939-45) and the 1944-46 drought. The community was still struggling, but new developments were helping - the sowing of medics, changing of crop rotations and the war on rabbits, which had caused extensive soil erosion and drift. The post-war period brought the completion of the change from horsepower to mechanical power, and in the 50's the sound of tractors became commonplace, drawing cultivators, harrows, seeders and reapers. The extra man on the farm was not needed so much, and was eventually replaced by machinery. That machinery could handle a greater area, and as the machines increased in size, so did the area able to be covered, with a progressive aggregation of farms. Where a farmer and a hired man had lived off an average farm, the economics of the new operation - expensive machinery, bank fi nance and insurance - meant a greater acreage often had to be worked for the same return. Was it any wonder that the town population decreased, not so many workers were required, not so many children attended school and fewer teachers were needed. There was some progress, however, as the fifties heralded a period of prosperity - the war against rabbits was being won, firstly with the spread of myxomatosis followed by carrot poisoning campaigns, and consequently soil erosion was being beaten. Changes in cultivating methods brought higher yields of grain. Diversification of crops, with closer subdivision of farms, also was paying off. Better road-making equipment tied in with the decreasing sand drift, and graded rubble roads improved. 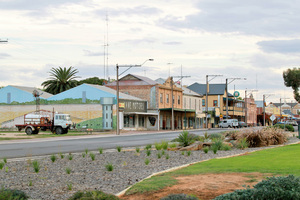 Town streets, which were used equally by farmers and townies alike, were eventually given attention, and although the Council judiciously refrained from spending rate money on township streets, special relief grants enabled the draining and sealing of some Pinnaroo streets to be carried out. The first effluent disposal system in the State was installed to serve the business houses, and the main street was sealed to its full width. No more kerbside mud to be carted into the shops, and no muddied ball gowns on a Wednesday night. Further effluent schemes were later put in to serve the rest of the township. 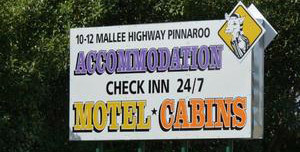 "Pinnaroo - Hub of the Mallee celebrating 100 years" by Pinnaroo Historical Society.